Age Invaders: Physical and Social Mixed Reality Games – ixd! 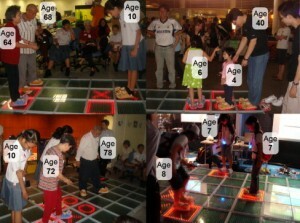 Age Invaders is an intergenerational family entertainment system, which focuses on physical and social interactions using a mixed reality floor system. The main design goals include: facilitating interactions between users with varied levels of skill in utilizing technology, utilizing the familiar physical motions from other activities to make an intuitive physical interface, and encouraging social interactions among families and friends. From left: Mr Tim Merritt, research intern from Jyvaskyla University Finland; Mr Khoo Eng Tat, team leader; Mr Mervyn Lian, final-year ECE student; Mr Kelvin Yeo, final-year ECE student; and Mr Jerome Lee, research intern from Singapore Polytechnic. Khoo, E.T., Merritt, T., Cheok, A.D., Designing Physical and Social Intergeneration Family Entertainment. Interacting with Computers. Special Issue: Enactive Interfaces, volume 21, issue 1-2, pages 76-87, January 2009. Khoo, E.T., Merritt, T., Cheok, A.D., Lian, M., and Yeo, K., Age Invaders: User Studies of Intergenerational Computer Entertainment. Entertainment Computing ICEC 2007, 6th International Conference, Shanghai, China, September 15-17, 2007, Springer, Volume 4740, 231-242. 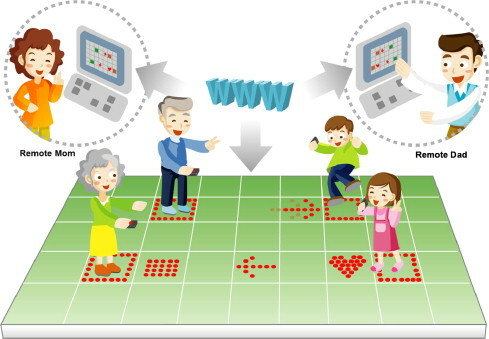 Age Invaders is a social physical game which allows grandparents to play harmoniously together with children in physical space, while parents can join in the game remotely through the internet. The parents can adjust the challenge for the older and younger players to balance the play. Joining from the virtual world, the parents can also introduce rewards/ power-ups and challenges. 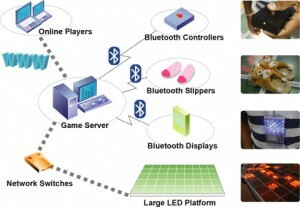 This work was developed as part of the PhD thesis work of Eng Tat Khoo and members of the Mixed Reality Lab, Singapore. Tim Merritt joined the team in 2007 and conducted user research of players engaged in the game and articulation of the design process.